For other uses, see Air-to-ground missile. An anti-tank missile (ATM), anti-tank guided missile (ATGM), anti-tank guided weapon (ATGW) or anti-armor guided weapon, is a guided missile primarily designed to hit and destroy heavily armored military vehicles. ATGMs range in size from shoulder-launched weapons, which can be transported by a single soldier, to larger tripod-mounted weapons, which require a squad or team to transport and fire, to vehicle and aircraft mounted missile systems. The introduction to the modern battlefield of smaller, man-portable ATGMs with larger warheads has given infantry the ability to defeat light and medium tanks at great ranges, though main battle tanks (MBTs) using composite and reactive armors have proven to be resistant to smaller ATGMs. Earlier infantry anti-tank weapons, such as anti-tank rifles, anti-tank rockets and magnetic anti-tank mines, had limited armor-penetration abilities and/or required a soldier to approach the target closely. PARS 3 LR fire-and-forget missile of the German Army. 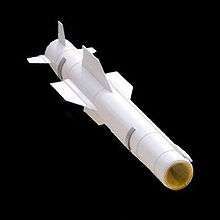 The RAF's Brimstone missile is a fire and forget anti-tank missile. 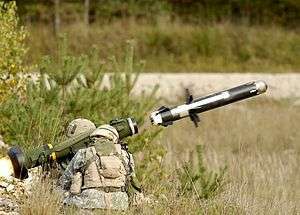 Germany developed a design for a wire-guided anti tank missile derived from the Ruhrstahl X-4 air to air missile concept in the closing months of World War II. Reliable information for this weapon is elusive. It was never used in combat and allegedly had serious guidance to target issues. 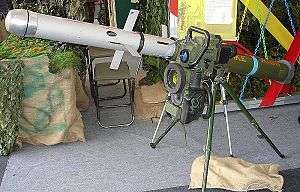 The SS.10 is the first anti-tank missile widely used. It entered service in the French Army in 1955. It was also the first anti-tank missile used by the US Army and Israeli Defense Forces. The Malkara missile (from an Aboriginal word for "shield") was one of the earliest anti-tank guided missiles (ATGMs). It was jointly developed by Australia and the United Kingdom between 1951 and 1954, and was in service from 1958 until gradually replaced by the Vickers Vigilant missile in the late 1960s. It was intended to be light enough to deploy with airborne forces, yet powerful enough to knock out any tank then in service (it used a 26 kg HESH warhead). First-generation manually command guided MCLOS missiles require input from an operator using a joystick or similar device to steer the missile to the target. The disadvantage is that the operator must keep the sight's cross hairs on the target and then steer the missile into the cross hairs—i.e. the line-of-sight. To do this, the operator must be well trained (spending hundreds of hours on a simulator) and must remain stationary and in view of the target during the flight time of the missile. Because of this, the operator is vulnerable while guiding the missile. The first system to become operational and to see combat was the French Nord SS.10 during the early 1950s. Second-generation semi-automatically command guided SACLOS missiles require the operator to only keep the sights on the target until impact. Automatic guidance commands are sent to the missile through wires or radio, or the missile relies on laser marking or a TV camera view from the nose of the missile. Examples are the Russian 9M133 Kornet and the American Hellfire I missiles. Again, the operator must remain stationary during the missile's flight. Third-generation guidance systems rely on a laser, electro-optical imager (IIR) seeker or a W band radar seeker in the nose of the missile. Once the target is identified, the missile needs no further guidance during flight; it is "fire-and-forget", and the missile operator is free to retreat. However, fire-and-forget missiles are more subject to electronic countermeasures than MCLOS and SACLOS missiles. Examples include the German PARS 3 LR, Israeli LAHAT and Spike and the Indian Nag. Most modern ATGMs have shaped charge high explosive (HEAT) warheads, designed specifically for penetrating armor. Tandem-charge missiles attempt to defeat ERA protected armor. The small initial charge sets off the ERA while the follow-up main charge attempts to penetrate the main armor. Top-attack weapons such as the Indian Nag, American Javelin and the Swedish Bill are designed to strike vehicles from above, where their armour is usually much weaker. Spike (missile), capable of making a top attack flight profile. Countermeasures against ATGMs include spaced, perforated, and composite armour, explosive reactive armour, jammers like the Russian Shtora, and active protection systems (APS) like the Israeli Trophy and the Russian Arena. Armour systems have continued in development alongside ATGMs, and the most recent generations of armor are specifically tested to be effective against ATGM strikes, either by 'tricking' the missile into not detonating against the armor itself (such as in Slat armor) or using some form of reactive armor to 'attack' the missile upon impact, disrupting the shaped charge that makes the warhead effective. Both come with the downside of significant weight and bulk. Reactive armor works best when a vehicle is specifically designed with the system integrated and while developments continue to make armor lighter, any vehicle that includes such a system necessitates a powerful engine and often will still be relatively slow. However, inclusion of such armor in older vehicles as a part of re-design is possible, as in the numerous types derived from the T-72 do carry reactive armor (in addition to engines up to >20% stronger). Slat armor is lighter and as such can be added to many vehicles after construction but still adds both bulk and weight. Particularly for vehicles that are designed to be transported by cargo aircraft, slat armor has to be fitted in field after deployment. Either approach can never offer complete coverage over the vehicle, leaving tracks or wheels particularly vulnerable to attack. Jamming is potentially an effective countermeasure to specific missiles that are radar guided, however, as a general purpose defense, it is of no use against unguided anti-tank weapons, and as such it is almost never the only defense. If jamming is used continually, it can be extremely difficult for a missile to acquire the target, locking on to the much larger return from the jammer, with the operator unlikely noticing the difference without a radar screen to see the return. However, any missile that has a back up tracking system can defeat jamming. Active protection systems show a great deal of promise, both in counteracting ATGMs and unguided weapons, but are not yet a proven technology. Compared to armor systems, they are very lightweight, can be fitted to almost any vehicle with the internal space for the control system and could, in the future, be a near-perfect defense against any missiles. The weakness of the systems include potential developments in missile design such as radar or IR decoys, which would drastically reduce their chance to intercept a missile, as well as technical challenges such as dealing with multiple missiles at once and designing a system that can cover a vehicle from any angle of attack. While these may be answered and allow for lightweight, highly maneuverable vehicles that are strongly defended against missiles and rockets that are extremely well suited for urban and guerrilla warfare. However, such a system is unlikely to be as effective against kinetic energy projectiles, making it a poor choice for fighting against tanks. Traditionally, before "fire-and-forget" ATGMs were used, the most effective countermeasure was to open fire at the location where the missile was fired from, to either kill the operator or force him to take cover, thus sending the missile off course. Smoke screens can also be deployed from the MBTs smoke discharger, and used to obscure an ATGM operators line of sight. While fire and forget missiles have definitive advantages in terms of guidance and operator safety, and include abilities such as top attack mode, older missiles continue in use, both in the front line armies of less developed countries, and in reserve service the world over, due to their lower cost or existing stockpiles of less advanced weapons. ↑ "T-90 tank". Archived from the original on 2008-01-29. Retrieved 2008-01-29. is tested against ATGMs. ↑ British tank sustains damage overseas. ↑ John Stone (2000). The Tank Debate: Armour and the Anglo-American Military Tradition. Harwood Academic Publishers. p. 78. ISBN 9058230457. Wikimedia Commons has media related to Anti-tank missiles.